Red Rocks is situated to the west of Hoylake and adjacent to the beautiful Dee Estuary and is an important site for nature conservation on the Wirral Peninsula. 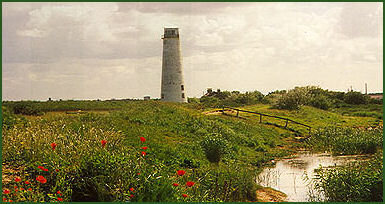 Part of the site is managed as a nature reserve by the Cheshire Wildlife Trust. Red Rocks Nature Reserve consist of two main habitats, the southern section towards the town of West Kirby and Red Rocks Marsh and the sand dunes, and to the north Hilbre Point overlooking Bird Rock and East Hoyle sand bank. The flora and fauna at the reserve is highly diverse. The marsh is an excellent site for birdwatching and attracts a considerable variety of migrants on passage in spring and autumn. The reed beds contain breeding Sedge and Reed Warblers in spring and summer whereas the sand dunes are full of sky larks and occasional Stonechat. Birds frequently seen at Red Rocks are Redwing, Fieldfare, Chaffinch, Greenfinch, Siskin, Brambling, Yellowhammer, Reed Bunting, Sedge Warbler, Snow Bunting and Willow Warbler. The reserve is also home to over 50 species of flowering plants. The main interest of the Red Rocks nature reserve is that it is home to the only breeding colony of Natterjack toads (Epidalea calamita) on the Wirral Peninsula. The toads breed in the pools between the Red Rocks and West Kirby. Coastal Sand Dunes provide the best habitat in Britain for the Natterjack Toad. Adults are 60–70 mm in length and are distinguished from Common Toads by a yellow line down the middle of the back, they can also camouflage themselves into the background by darkening and lightening their skin. They have relatively short legs, and this gives them a distinctive gait, contrasting with the hopping movement of many other toad species. Natterjacks have a very loud and distinctive mating call, amplified by the single vocal sac found under the chin of the male animal and can claim to be the noisiest amphibian in Europe with a call that can be heard several kilometres away. 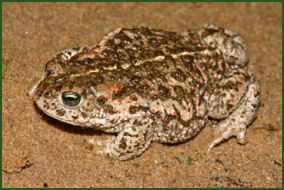 The toads are mainly nocturnal animals, but in loose sand their tracks can often be seen. The Natterjack Toad spawns between the end of April and July, laying 'strings' of eggs in shallow, warm pools. A threatened species, the Natterjack is strictly protected by British and European law.